The originators of multi sampled drums and Drumkit From Hell, Toontrack, Music presents an all-new SDX expansion pack for Superior Drummer 2.0 - The Metal Foundry SDX. The Metal Foundry SDX is an all-new recording with Meshuggah drummer Tomas Haake, featuring seven massive drum kits, spanning 300,000 sound files of raw, single hit drum recordings in the vein of Drumkit From Hell and dfh Superior, covering Hard Rock to Metal, from the early Blues tinged sound of the late 60s to the fragmentation of today’s music, from Power through Thrash, Death and Progressive Metal. 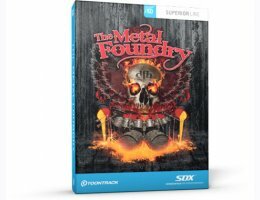 The Metal Foundry SDX celebrates the Toontrack Music Hard Rock and Heavy Metal legacy of the first Drumkit From Hell, on which the company has built its following. This in turn has spawned such groundbreaking products as DFH Superior, EZdrummer and Superior Drummer 2.0. The Metal Foundry SDX was recorded and produced at Atlantis Studios in December 2008 by the original Drumkit From Hell recording team, Mattias Eklund (Toontrack Music), Fredrik Thordendal (Meshuggah), Daniel Bergstrand (Dug Out Studios) and Tomas Haake (Meshuggah).